Loose parts are having a moment: Putting the play back in playgrounds with sand, water, and blocks. And the plastic forts. Here’s how to put the play back in playgrounds. Photograph courtesy of Imagination Playground. More than any playground in recent memory, the Imagination Playground has inspired an outburst of excitement. It’s a hit with the hip parents who take their kids to Dan Zanes concerts, and is just as crowded as one. But it also represents something much more mundane: the triumph of loose parts. After a century of creating playgrounds for children, of drilling swing sets and plastic forts into the ground, we have come back to children creating their own playgrounds. Loose parts—sand, water, blocks—are having a moment. As the psychologist Ellen Sandseter has pointed out, the American attitude is a fundamental miscalculation of the risks: Kids who are bored stay inside and staying inside is ultimately far worse for your health than a broken arm. Talk about why we can’t have nice playgrounds here typically begins and ends with lawsuits. But potential legal action is too easy an excuse for not rethinking playgrounds, says Darell Hammond, head of the play-promoting nonprofit KaBOOM!. Change “requires all of us doing something different, not just a few law changes.” In short, it requires all of us to be a little less panicked, and honestly, that’s probably too much to ask, at least in the short term. Which is why loose parts may be the best hope for the future of playgrounds right now. Rockwell’s playground is still an adventure playground—a construction site with all the splintery edges sanded down. It’s what an adventure playground looks like in a risk-averse culture. And it promotes the kind of play we think children should be doing now: not with just their bodies, but with their minds. The Imagination Playground is a much more cognitive vision of the playground. No one would confuse it with a jungle gym. Rockwell himself is well-aware of this. At the adventure playgrounds of decades past, he says, “they did things much more dangerous than you could get away with today in a litigious society—working with hammers and nails and actually building things.” (These types of playgrounds do still exist in the United States, but barely.) So instead of physical risk, Rockwell talks about creative risk. At the Imagination Playground, you can dare to build whatever you want—knowing that tomorrow it will be gone. “Part of the impact of the playground is that it is impermanent,” he says. 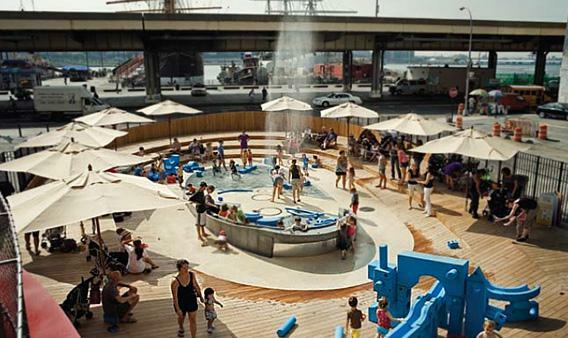 The rise of the loose parts playground extends well beyond lower Manhattan. In various versions, there are more than 1,000 sets of Rockwell’s blocks out there, and thanks in part to a partnership with KaBOOM!, a lot of those blocks are far from the tax brackets of the South Street Seaport. When I talked to KaBOOM!’s Hammond, he’d just come back from Miami, where the bright-blue blocks are in a low-income child care center. Of course, loose parts don’t have to be designed by David Rockwell—they can be junk from your basement. Detroit’s Arts & Scraps is a loose parts-focused organization where the loose parts are, well, scraps. Early childhood educators, for their part, adore loose parts for the open-ended, spontaneous sort of play they encourage, which is very much in line with the new orthodoxy of how young children learn. “When you have loose parts, you don’t have the same repetitive pattern of play,” Hammond says. “It’s much a more circuitous path.” And that’s what you want from play. “You want to see kids escape into this zone in which they lose themselves.” In other words, loose parts are perfectly suited to assuage the paradoxical parental anxieties of the moment: We want our children to have time to play but we also want that play to be productive—to be more than play. Of course, loose parts playgrounds are messier than plasticized fort structures. At the Imagination Playground, there are “play associates” present, partly to tell the parents to sit down, partly to “facilitate play,” in their words, but also to put out the props and then put them away again. (Playworkers are much more common in England; they’re almost unknown here.) Loose parts require more oversight than a slide. They can walk away. Stanley Hall’s sand pile, it turns out, isn’t a portrait of the past. It’s a vision of the future.